New National Campaign to Help Bystanders Recognize, Respond to Stroke Warning Signs F.A.S.T. Q&A: Are You Successfully Using Telehealth in Diabetes Management? Could Less Invasive Treatment Improve Survival in Early Stage Breast Cancer? © 2013 Disease Management Digest by Healthcare Intelligence Network. (732) 449-4468,Fax (732) 449-4463; e-mail info@hin.com, Web sitewww.hin.com. 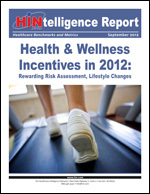 Free Download: Health & Wellness Incentives in 2012. This updated OSHA Manual for Healthcare Practices contains: The exposure control action plan, hazard communication action plan, emergency action plans, and more. Order your manual plus supplemental state regulations guidance today. "Our health coaching approach begins with technology. With the use of medical and pharmacy claims, HRA information and biometric data, we determine an individual's current health status." Watch the webinar today or order a training DVD or CD-ROM.